Ceiling fans that have earned the ENERGY STAR meet strict energy efficiency, quality, and performance criteria set by the US Environmental Protection Agency, tested by accredited labs, and certified by a third party. Saving energy helps you save money on utility bills and protect the climate by reducing greenhouse gas emissions. Are 40% more efficient than conventional fan/light units. Provide quality, cutting edge design, and the latest in efficient technology. If your fan doesn't include lighting and you decide to add it later, be sure to purchase an ENERGY STAR certified light kit to get the advantages of ENERGY STAR lighting as well. Learn more about ENERGY STAR certified LED lighting. Ceiling fans with light fixtures originally qualified for the ENERGY STAR label in January, 2002. What Else Should I Look for When Buying ENERGY STAR Certified Ceiling Fans? In addition to the ENERGY STAR label there are several other items to consider when purchasing and installing a new ceiling fan. 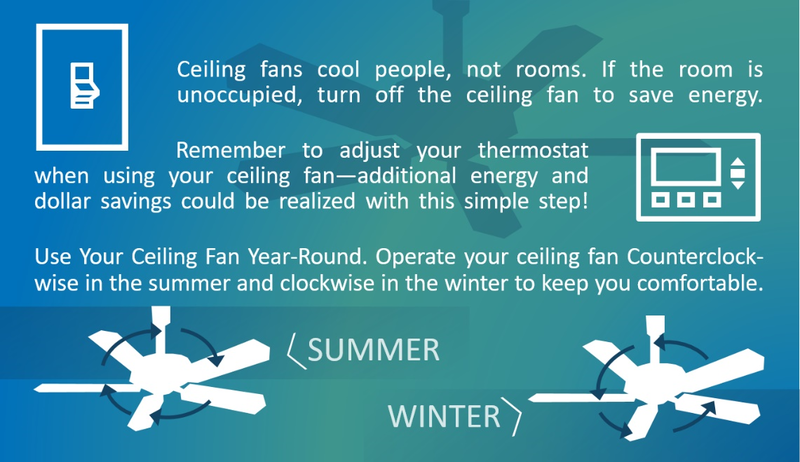 Learn more in the Ceiling Fan Buying Guidance (PDF, 658 KB). Need light bulbs for your new ceiling fan? Realize even more savings when you use ENERGY STAR certified light bulbs! Find what bulb best fits your needs with the Choose a Light Guide. ENERGY STAR certified ceiling fans with lights are 40% more efficient than conventional fan/light units, saving you at least $60 in energy costs over the fan's lifetime.